Tea and a good soak in the bath! Hello it’s Kate here! I’ve just got back from a busy day driving here there and everywhere in the Cotswolds. I’m not complaining as it really is the most beautiful place to drive through! I felt really lucky and thought how lovely to escape the buzz and noise of the city as I pulled into the drive of the first gorgeous ‘contemporary-chic’ hotel I was meeting with (I will be back here soon to tell you about the hotel). The birds were chirping, there were little purple and yellow crocus nestled in clusters at the feet of the tree trunks and there were tiny little lambs baaing and bleating and wobbling around the surrounding fields. Bliss! It seemed like a really long day of driving, talking, meeting new people, tasting tea, looking at numbers while at the same time trying to find spots of reception in such an unspoilt place to reply to urgent emails and phone calls and of course keep up with the world of twitter! So, it was lovely to arrive back, unload the car and land in a familiar place. All I fancied was a long soak in an indulgent bath, a pot of soothing tea and a flick through my latest glossy magazine. At the village shop I treated myself to a Green & Spring Indulging Bath Oil and candle – comforting rose, sensual jasmine, restorative elderflower and restful clover – so that’s exactly what I did! 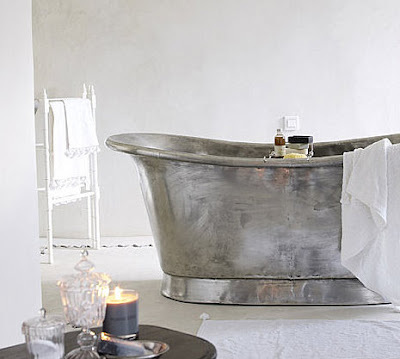 And how good it was – even though I didn’t have a bath quite like my dream bath! To top of my indulgent evening I made a pot of uplifting Rosey white tea to sip while I chilled out, listed to the sounds of Paper Aeroplanes, flicked through RED magazine and soothed away the stresses of the day. I can’t recommend it enough. But, what would your favourite product, tea and music to wind down to?